This Works for Any Size Block! Those leftover blocks can be quickly made into pot holders with these easy instructions. Put test blocks and extra blocks to good use in the kitchen. Smaller blocks are great for pot holders while larger ones will be lovely trivets. Insul-Bright batting provides additional heat proofing for both. These pot holders are not only quick and easy, they also make great gifts. 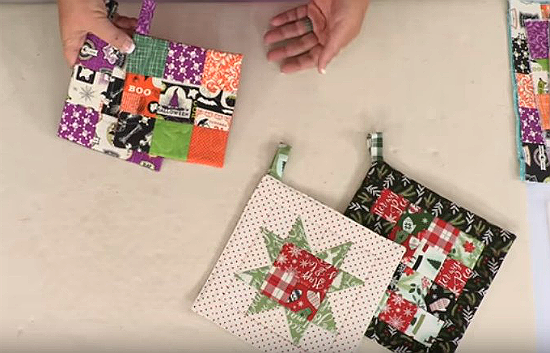 Blocks made from seasonal fabrics are wonderful for the holidays, although pretty pot holders in appropriate colors are welcome gifts all year long. In the following video Carmen Geddes shows how to put the pot holders together.